Registering is easy! Just follow these easy steps. Goto apartmentpermits.com/resident and you will see the following screen. Begin by searching by the street or the name of the apartment complex. 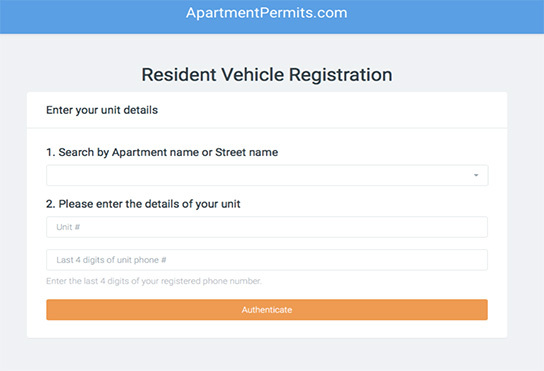 Then enter your unit number and confirm with the last 4 digits of your phone number. 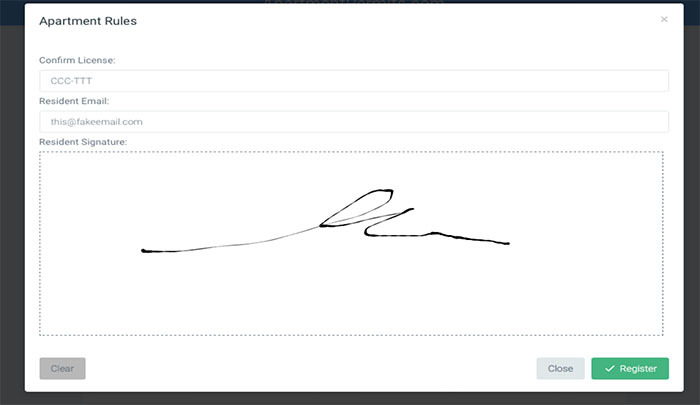 Once you enter all the required information and click on “Authenticate” you will see something similar to the screen to the right. 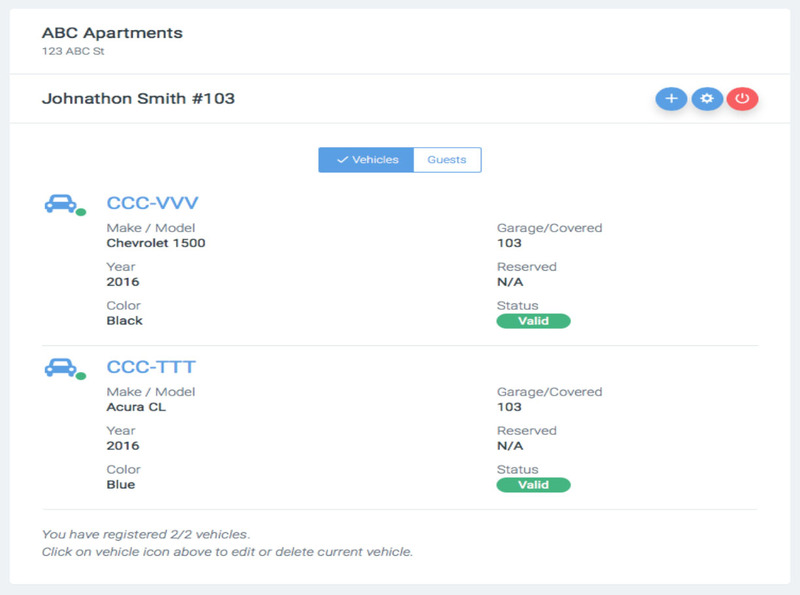 This view will show your current vehicles or will be blank depending on if your account currently has any vehicles associated with it. To add a new vehicle click on “Add Vehicle” (the plus sign) near the top right corner. You will be prompted to enter your vehicle details. After you do this you will see the following screen. This is your property’s parking addendum. It’s very important you read and understand it. Afterwhich confirm your license plate again and enter your email so you can receive your signed copy at the end of the process. 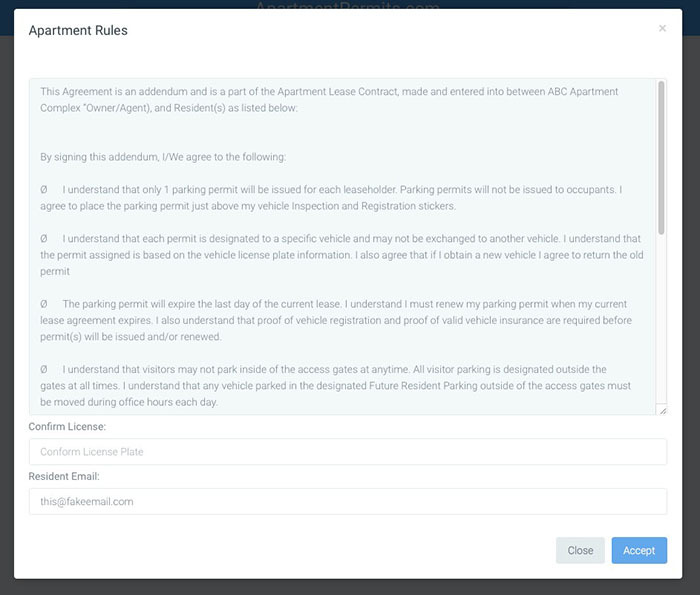 You will then electronically sign your property’s parking addendum acknowledging that you have read and understand the rules. Finally you will be taken back to the main view which will show all your validly registered vehicles. It’s important to note a couple final things that you should check. Take a second and verify that if you have a reserved and/or a covered parking space that’s assigned to you that it’s listed under each of the vehicles. If you should have a space number there and don’t please contact your apartment office. You may click on the settings icon to update your phone number at any time. You may touch on the vehicle icon for any vehicle to update your license plate or delete a vehicle you no longer are using. 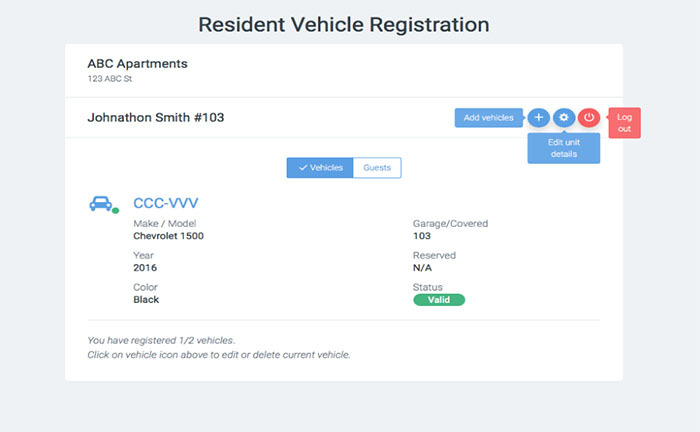 Along the bottom of the screen you will see how a total of how many vehicles you have registered and how many total vehicles you are allowed to have registered at any one time.